This is the first of a series of three posts. In this post we'll see how the Greeks developed a system of geometry - literally "Earth measure" - to assist with planetary navigation. We then will see why their assumption that the Earth is flat means that Euclidean geometry is insufficient for studying the Earth. The Earth's spherical surface looks flat from our perspective, but is actually qualitatively different from a flat surface. In the ensuing posts, we'll see why this implies that it is impossible to make a perfectly accurate map of the Earth, and build on this idea to get a glimpse into Einstein's revolutionary theories regarding the geometry of the space-time universe. You’ve probably heard about Einstein, the physicist famous for his theories of space-time relativity, and whose face and wacky hair-do have become synonymous with the term “genius”. During the next three posts we’re going to introduce some basic concepts involving geometry, which means “the measure of the Earth”, use these concepts to explore the process of making accurate maps of the Earth, and then build from here to get a grasp of some of the basic tenets of Einstein’s revolutionary general theory of relativity. These topics, in the area of math known as “differential geometry”, are both simple and cool, so read on! Before we get to broader level ideas about the universe, let’s start here on Earth. We all know that the Earth is a sphere, right? This is usually taught to us quite early in our school studies, but it’s not at all obvious, because for most of the things we do on the surface of the Earth, it seems to be flat. But it doesn’t appear to be flat – what about all the mountains and valleys? Good point – the Earth appears to be flat overall, with irregularities such as mountains and valleys. From our vantage point as relatively small creatures living on the surface of the planet, it appears that we are living on a more-or-less flat surface, like the top of a table, rather than a curved object that’s very close to a sphere in shape. 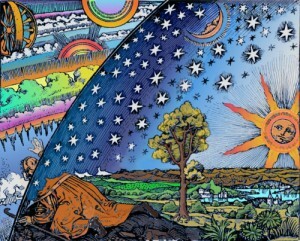 In this 1888 French depiction of medieval cosmology, a man stretches his head beyond the Earth’s firmament, attempting to gaze into the heavens. This has both literal and symbolic connotations – the man is both literally sticking his head beyond the edge of the Earth, and also, symbolically, attempting to gaze beyond the Earth’s surface into the unknown. This literal view of the flat Earth is also promulgated in the Old Testament of the Bible, and other historical sources. So how did we find out that the Earth is round, without flying to the moon? You can see this directly on the Earth by looking at the Earth’s curved shadow as it crosses the moon, and by watching ships as they approach from the sea – the first part of the ship you see is the top of the mast, and the body of the ship becomes visible as it sails closer, which is a result of the fact that the ship is in fact sailing around the curved Earth, not on top of a flat Earth. Both of these observations imply that the Earth is not flat. It is also possible to determine that the Earth is not flat simply by making measurements directly on its surface, using a property known as holonomy. 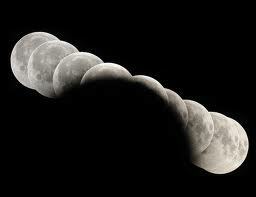 NASA time-lapse image of the Earth's shadow on the moon. The ancient Greeks, assuming the Earth was flat, developed a powerful set of tools to use to navigate the surface of the Earth, such as sailing across the Mediterranean Sea. These tools were made into a system of geometry by a Greek man named Euclid, who lived around 300 BC. 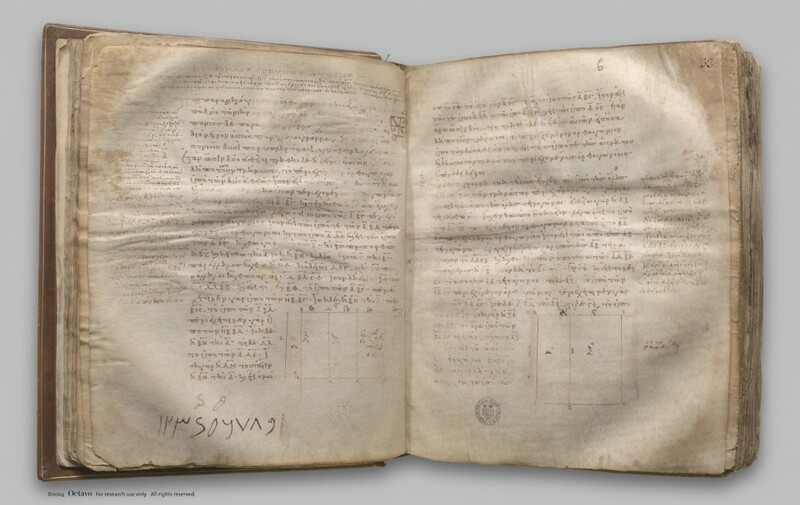 Euclid’s system was especially powerful and influential since it organized Greek knowledge regarding geometry – the measure of the Earth’s surface – into a coherent, logical system. The two key units of measure in Euclidean geometry are length and angle. You may be familiar with the concepts of length and angle from using rulers or protractors. In order to navigate on a ship or on land, you need to know two basic facts: which direction you’re heading, and how far you have traveled. 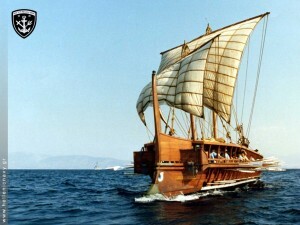 In order to navigate the Earth’s surface, such as on a ship on the ocean, all we need is these two units of measure – the direction in which to travel, which can be given using a compass as an angle measured from due north, and the distance by which to travel, which can be calculated using a ruler on a map together with measurements of the ship’s speed, or, for longer distances, with calculations based on star positions. Euclid was able to create a powerful way to systematize the knowledge the Greeks developed regarding “the measure of the Earth” – geometry. Importantly, though, Euclid and the Greeks based their study of the Earth on the assumption that the Earth is flat. One example of how this assumption plays out in Euclid’s system has to do with parallel lines – lines that lie at the same angle with respect to each other. 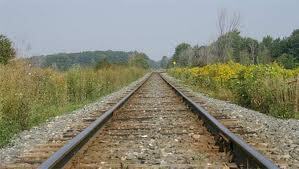 A good example of two parallel lines is seen in this picture of two straight train tracks. Imagine if we extend these two train tracks in a straight direction, so that each of the two tracks is always going straight ahead. In Euclidean geometry, which is geometry on a flat surface, it’s assumed that two parallel lines, such as these train tracks, will never meet, no matter how far they are extended. This picture shows two “lines” on a sphere. If you extend a straight line on a sphere, you eventually will come back to where you started, since you will travel around the Earth. In the same way, you can sail west from Europe, through the Panama Canal, across the Pacific to Asia, through the Suez Canal, and eventually make it to where you started, by travelling westwards. A straight line on a sphere such as the Earth is actually a circle – or what geometers call a “great circle”. In the picture, we see two adjacent great circles that are parallel – in the same direction – in the upper right part of the picture, but which intersect in the lower left. On a sphere such as the Earth, parallel lines actually do intersect! Another way to imagine this is – if you and a friend start walking next to each other on a sphere, and each continue to walk straight ahead, your paths will eventually intersect. But, if you both are walking straight, won’t you stay the same distance apart? On a flat surface, you would stay the same distance apart. But since the Earth is a sphere, its surface is curved. So if you and your friend both walk in a straight line, your paths will move closer and closer, due to the underlying curvature of the surface of the Earth, and your paths will eventually intersect, as seen in the picture above. This again suggests that geometry on a sphere – what geometers call spherical geometry – is fundamentally different than geometry on a flat surface. This is crucial because the Earth appears to be flat from our vantage point on its surface, but is actually a sphere. This means that the “flat surface” geometry developed by the ancient Greeks and systematized by Euclid – what is known as Euclidean geometry – is actually insufficient for studying the Earth. 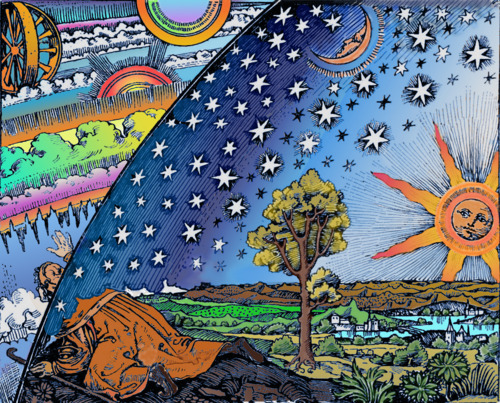 This insight – the fact that the Earth is not a flat surface means that its geometry is fundamentally different from flat-surface geometry – led to the development of non-Euclidean geometry – geometry that has different properties than standard, flat surface geometry. A consequence of this is the fact that it is impossible to create a perfect map – representation – of the Earth, on a flat surface. The art and science of map-making exists due to this fundamental distinction between flat surfaces and spherical surfaces. This is what we’ll be looking at in our next post. Stay tuned. There is a slight error in your thinking, when you say that friends walking next to each other would finally meet. That would only happen if each of them happens to be walking on a great circle. What would actually happen is that one of the friends would walk a tiny bit longer than the other (assuming the Earth was a perfect sphere and perfectly smooth, which it isn’t of course. Geometers figured out how to use the parallels – circles that are parallel to the equator, but are not great circles, as the meridians. Wikipedia has a lot about maps, globes and cartography – with lots of links. You might want to add something like in Bibliography, even though it has less to do with the math of the article. Thank you for noting this, Bonnie. If each friend is walking straight ahead, measuring “straightness” from their own point-of-view, they will eventually intersect. If they focus instead on maintaining a constant distance apart, each will have to slightly shift the direction in which they are walking in order to avoid moving closer to each other, due to the underlying curvature of the surface on which they are walking. Again, this assumes that the Earth is more or less a perfect sphere. The primary point is that the underlying curvature of the Earth is not noticeable when standing still on its surface, but its curvature has definite and measurable effects that someone can detect by moving around its surface. I’ll check out the wikipedia site on this, but as it’s usually considered off-limits for academic papers (since anyone can edit it) I’m reluctant to use it as a reference. Wikipedia articles usually come up highly-ranked in google searches, anyways.